Flyers, billboard advertisements or TV ads are now almost a thing of the past. Due to the digital revolution and the increase in online marketing, the search and purchase behavior of customers has changed and unlocked new marketing opportunities. With the variety offered by the Internet which provides real-time information, consumers are now more likely to inquire online about important information and no longer have to rely on “info catalogs” or anything else. What’s even more important to note is that the balance between push and pull importance has also changed. Where users used to listen only passively, today active interaction is set. It is, for this reason, many businesses have moved away from the traditional methods of marketing and are now reshaping their marketing strategies to ensure that their tactics are in line with the new trends. However, despite the big shift to online marketing, it doesn’t mean traditional marketing should be given the boot. For many businesses, both traditional and online marketing can both work hand in hand for better communication with potential customers. If your marketing department is on a standstill and unsure how to move forward, continue reading to find out how what both traditional and online marketing can do for you. “Traditional Marketing” is also referred to as offline marketing. It includes all print media, such as newsletters, brochures and magazine advertisements. It also includes transmitting advertising, such as TV and radio, in addition to direct mailings such as postcards, catalogs, and personal flyers. The advantage of traditional marketing is that these techniques are already proven and have a high success rate. They are media that the audience already understands and does not have to “learn” anew. The target group and the market are worked out directly and it is therefore customer-specific. A message is created in advance with the help of copywriters and the communication consists of clear, long sentences. The main negative aspect of traditional marketing is that the target groups are shifting enormously due to the rapid increase in Internet users. In addition, print media have moved further into the background in times of environmental protection and sustainability. Traditional marketing can only stand alone in special cases. 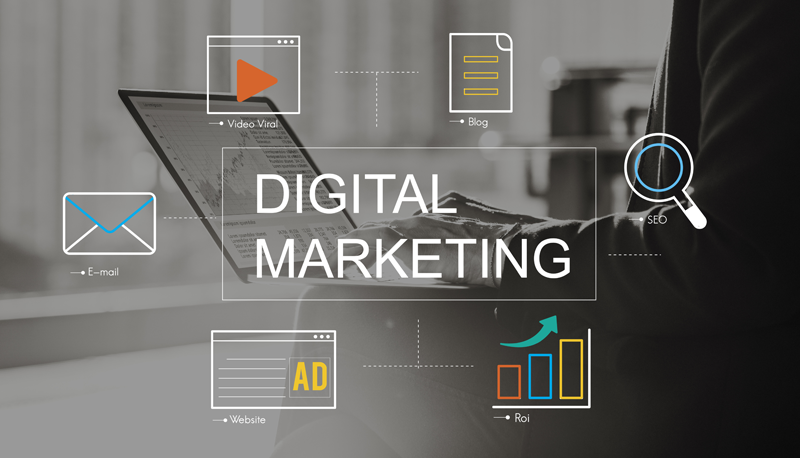 Digital marketing involves many different advertising methods such as social media, content marketing, SEO marketing, banner advertisements, Google ads, video marketing, influencer marketing and more. It’s important to note that each digital marketing method is unique and has its own perks when it comes to strategizing. For example, social media marketing is not limited in time; its 24-hour presence must be used by responding quickly to comments and take the general inputs of the community. The reach has, therefore, no end because the user can interact directly and easily. This requires a high degree of flexibility and presence. However, it is beneficial that you can use SEO tools to measure how well your advertisements are reaching your customers. You do not have to wait weeks to get feedback but act in real time. Advertising online is also cheaper than TV advertising. This is a big advantage when it comes to costs. As the budget of advertising spend has shifted, many companies are cutting down on classic marketing to put these expenses into online marketing. By 2019, 50% of the marketing budget will flow into mobile advertising. That’s 75% spent on digital advertising. That, of course, drives up the investment factor. Traditional Vs Digital Marketing – Which one to Invest in? No doubt traditional marketing strategies are no longer sufficient without the support of digital online strategies. With the help of a digital marketing agency, online marketing channels can be adapted to the appropriate target group and thus reach more potential customers with less budget than purely traditional methods. However, it doesn’t always have to be one or the other – Why not both? This is not about whether offline or online is “better”, but to find a way, how one channel can meaningfully support the other. Traditional marketing strategies as an additional advertising channel provide a good foundation to generate sales. Successful marketing measures must be developed individually for each company and a balanced marketing mix with targeted focus is still essential, depending on the company. For example, the channels merge when Internet users watch a TV show on their tablet, computer, or cell phone. Here, the actual push content from television is transformed into pull information, as the user himself decides how and where he watches the series. The same thing works with newspaper reading – many publishers have already recognized that many users enjoy reading their newspapers on apps, instead of the paper format. But this is not the case in every age group, hence why paper publications are still available. The age of the desired target group is a big decision factor, which area should be used more. As the younger generation approaches social media marketing, traditionalists (those between the 1920s and 1940s) and baby boomers (born in the late 1940s through mid-1960s) will feel more comfortable with traditional advertising. The older generation trusts the local media more, and would rather buy a product if it is advertised in a newspaper earlier. For the most part, digital natives are only encouraged to buy from online ads. Comparing the characteristics of both marketing variations, in conjunction with your marketing strategy, can help you to create the perfect online-offline plan.